Vikas Bhatia, a junior in Chemical Engineering, helps a high school student at the FIRST build event on campus, Jan. 14, 2012. One hundred high school students came to campus on Saturday, Jan. 14, 2012, to build their FIRST Robotics Competition robots. Each team hopes to build and program robots that will advance to the D.C. Regional Competition at the Washington, D.C. Convention Center, March 29-31. The students represented 14 teams, mostly from Washington, D.C. UMD undergraduates volunteered to support this "build" event kick-off of the 2012 competition season. At last fall's First Look Fair on campus, more than 200 undergraduates signed up to support the efforts of FIRST in K-12 STEM education. Among the undergraduates who volunteered on Jan. 14 were three College Park Scholars students: Vikas Bhatia (Chemical Engineering; STS), Ruth Baldwin (Mechanical Engineering; SDU), and Martin Buck (Economics; STS). Vikas volunteered because he was curious to see how complex the robots were and he wanted to help high school students; he observed that "a lot of these high school kids were independent in their work, and seemed very motivated." Martin volunteered because he's "developed an interest in electronics and robotics;" he reflected that it was "a fun time working with younger students." The coaches and mentors of these teams were lively and committed. Because this kick-off build day required mechanical and wiring skills, mentors demonstrated techniques in these areas, watching as students became familiar with the materials and methods of construction. Coaches and mentors do many jobs in real life; they are committed parents, engineers working for government or the private sector, and professors! Materials for the build day were contributed by DeVry Institute of Technology, and the Science, Technology & Society program of College Park Scholars reserved an entire classroom building, the Cambridge Community Center, as the event site. Richard E. Hill, who works for Accenture, has mentored one FIRST Robotics Competition team as it has moved from one to another sponsoring school in Washington, D.C. Hill chairs the Washington, D.C., chapter of IEEE's Computational Intelligence Section, and sees his service for K-12 STEM education as an integral part of his professional identity. The Science, Technology and Society programs (STS Programs) support K-12 STEM service primarily because of the benefits that flow to college students. Engineers engaged in the more abstract learning of their early coursework can find great satisfaction in supporting a high school student to build a robot. Younger students also can develop new skills in mentoring and demonstrating so that a high school student can gain knowledge and abilities in working with materials. There are great professionals who volunteer with FIRST and other K-12 STEM organizations throughout their careers, and conversations with them can be important to undergraduates. In 2011-2012, 15 students in College Park Scholars have enrolled in the STS programs's CPSP249T course to volunteer weekly as mentors for an after school robotics club at Northwestern H.S. The STS programs are recruiting volunteers to support a FIRST Robotics Competition "Play Day" on Saturday, Feb. 18, 2012; about 9 students are helping to build a competition field on Friday night, and then more volunteers will support upwards of 40 regional high school teams, as they hold a "Rebound Rumble" on Saturday. On February 25th, volunteers will support Women In Engineering's Dream Conference and the Central Maryland Regional Tournament of the Maryland Science Olympiad. On March 10, we continue to recruit volunteers to serve as judges in support of the Dept. of Energy's Maryland Regional National Science Bowl competition for middle school students. 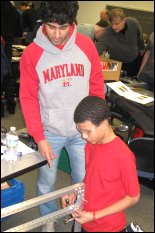 Other volunteers will help the Physics Olympics on April 21, Maryland Day on April 28 (supporting the Dept. of Physics), and the USA Science & Engineering Festival on April 29. Anyone interested in volunteering should contact the director of the STS Programs: email Betsy Mendelsohn. Whether student serve as mentors, judges or science demonstrators, they walk away from their service proud of themselves and impressed by the young people whose STEM aspirations they encouraged. "A lot of these high school kids possess skills that are presented in introductory engineering classes."